Old Blades, New Ideas | SPACE-BIFF! Millennium Blades is a game about a group of friends playing a game called Millennium Blades. And while you might think I’m being sort of a jackass since any game can be described that way (“Uno is a game about a group of friends being too bored to play anything but a game called Uno”), you’d actually be wrong. Because Millennium Blades really is a game about playing a game. And that game is called Millennium Blades. Hold on, let me explain. Part One: draft ’til you drop. 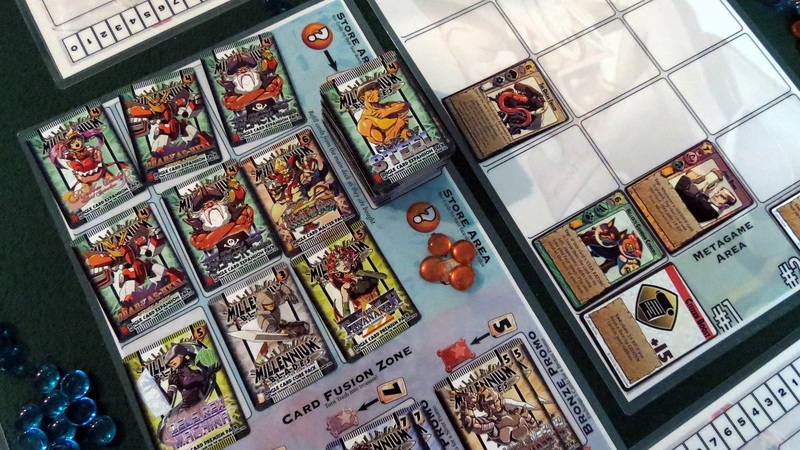 Millennium Blades — and we’re talking about the setting here, not the game-in-the-game — takes place in a fantastical alternate reality where collectible card games are king and the hottest of them all is Millennium Blades. The cool kids spend the lunch hour flipping cards and building decks, dreaming of making their first smooth million selling rares on the aftermarket like the pros, while the losers pop their collars and, I dunno, go to prom or something. I was trying to make it sound like an inversion of our world, but I have very little idea what the cool kids do here. That one thoughtless crime spelled the end of my all-too-brief relationship, the drying pen-marks on my arm scratchy and half-finished. It wasn’t even a good card. Here, I’ll show you. The image is burned into my memory forevermore. Anyway. The point is that the parallel universe of Millennium Blades is a sort of card-counter’s paradise, a place where you can tell a friend you really dig his lynx card without anyone getting their heart crushed, stamped, shattered, frozen solid, and shattered again. In Millennium Blades, everyone has friends willing to make a trade or chat about the latest expansion pack, and everyone worth a damn takes part in the local tournaments. It’s still a place where Wizards of the Coast will sue the coat off your back for any errant use of the word “tap,” but Millennium Blades has gotten around that by having you flip your cards facedown. Which is way cooler anyway. Part Two: beat your friends. 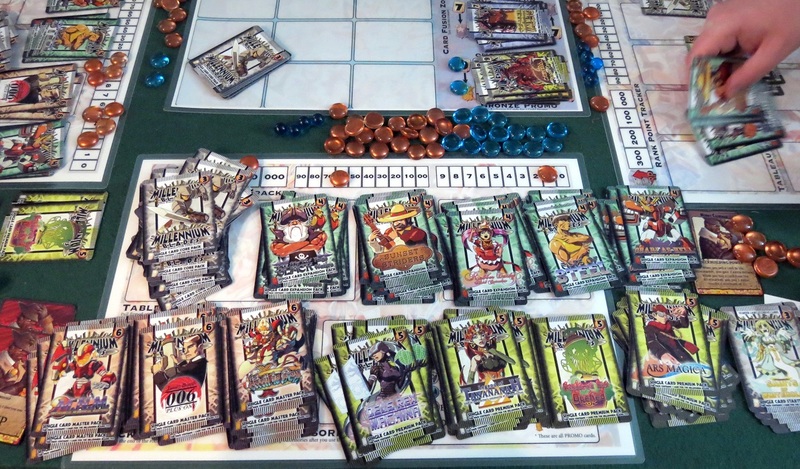 There are two alternating halves to each game of Millennium Blades. We’ll take them one at a time. The first is a timed phase that sees you messing around with your collection. You get an allowance of cash and a booster deck (complete with commons, uncommons, and rares), then proceed to sort, parse, and make the best possible use of each card. There’s a lot to keep track of in a short amount of time, and many of the cards are extremely text-heavy. Within the span of just a few minutes, you’ll need to read all your new cards, evaluate how to best incorporate them into a cohesive powerhouse for the upcoming tournament, possibly sell some cards or “fuse” a bunch into a more powerful card, manage trades with friends, watch the market for specific cards to snap up, and amass a prestigious collection. If it sounds overwhelming, it’s supposed to be, because it’s all about how you divide your attention. Do you focus on the event cards that represent the tournament’s evolving metagame? Or should you simply accept that your deck doesn’t have a chance of winning first place and try to pick up some prestige by turning in a huge collection? Or save up for some better boosters by selling lots of high-value cards? It’s even possible to earn points by making favorable trades to your friends, because while the universe of Millennium Blades is highly competitive, it’s also surprisingly friendly. When the timer beeps it’s time to move onto the second phase, a fast-playing minigame that pits your deck against everyone else’s. It’s a full tournament in fast-forward, with cards earning RPs — ranking points — by pulling off combos. For instance, you might play a card that will give you a bunch of points if your next card meets a specific requirement, or drop a card that will earn a lot of points at the end of the tournament but only if it survives that long. Then your opponents get a chance to play a card of their own, either boosting their own combos or messing with your plans. It’s possible, for example, to “clash” with other cards, resulting in a quick game of chance that often sees one player earning RPs while the other flips a card facedown, eliminating its abilities and potential points. There are all sorts of abilities to make use of, from the aforementioned gambles and card-killers to sure-thing points generators and defensive moves, though be warned that most of the time you’ll only get to use six of the cards in your ten-card deck. Prototype components, and still a table-bear. At first glance, the tournament half of the game is intensely simple. It might even come across as simplistic, especially for anyone involved with the more complex CCGs of our day, the Netrunners, Conquests, and Doomtowns. However, there are some interesting subtleties to be explored here, especially in the interplay between building a points engine and wrecking the engines set up by your opponents. The constant ticking of the first phase’s timer makes it difficult to account for every possibility that might arise during the tournament, and because the rules strictly forbid takebacks and addendums, misplacing a single card thanks to the pressure of the timed phase can cause your entire tableau to collapse in the middle of a tournament. The thrill of salvaging a mid-game implosion is one of the things Millennium Blades simulates best, and there’s nothing quite like the sudden clarity bestowed upon those desperately seeking a way to repair a broken deck. Clawing your way back into first place after a misstep — or even second or third place — is a hell of a lot of fun. It’s hard to describe, largely because I’ve never played anything quite like it. But I’ve got two examples that might explain what I’m talking about. First, like many real-world CCGs, Millennium Blades has an evolving metagame. This takes on two forms, the more underwhelming of which appears as a pair of event cards. “You get +15 RPs if you have a face-up Fire Element at the end of the tournament” is what these amount to, and while they shake up the game and force you to make alterations to your deck for each tournament, they’re not necessarily that interesting. But there’s another metagame, the one established between players as a trio of tournaments comes and goes. One player might rise to the top because they’re so good at turning in collections, and suddenly they’re toxic, nobody willing to make trades with them. Or perhaps there’s a player who builds a couple powerful combos in the first tournament, so everyone else adds one or two screw-you cards to their decks just to prevent him from using the same combos next time. In both cases, the “metagame” is altered, ebbing and flowing according to the gains and losses of previous games. It’s a delight to watch this play out, as it does a surprisingly good job of capturing the long-form feel of playing a game over and over with a tight-knit group of friends who have learned how to counter each other’s best plays. Another example arose during our most recent game. We’d just completed our first tournament, everyone earning a special card as a reward for participating. Somerset, who has never played a CCG more seriously than tinkering with core sets, was a bit strapped for cash. An item with no practical value to her strategy, and Somerset couldn’t bring herself to part with it. At least not that round. Later, after another tournament, she sold it off first thing. But for the time being, it had a different sort of value, an emblem of her performance. Like that damn lynx. It’s one of the few Magic cards I still have, if only because I’m still friends with my nerd buddy and haven’t spared a single thought for that nerd-despising girl in years. Millennium Blades accomplishes those weird little moments, captures the feel of making and using and refining a deck over a long time. 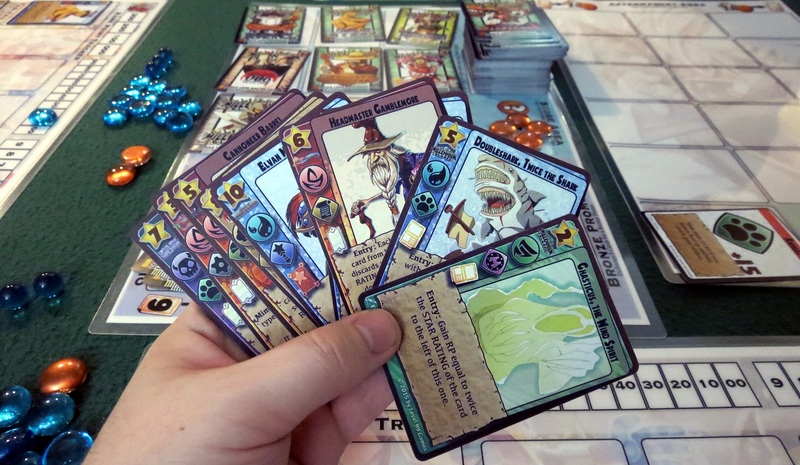 In a lot of ways it captures what I like best about collectible card games, and does so over the course of just a couple hours — and that in spite of the setup and breakdown making a huge mess of card-vomit across the table. Best of all, Millennium Blades is designed and published by Level 99 Games, the publisher of some of our favorite titles over the last couple years, like Devastation of Indines, Pixel Tactics, and Argent: The Consortium, and comes packed with variety, just like any self-respecting CCG. You can find Millennium Blades later this week on Kickstarter. I don’t often do previews or plug Kickstarter campaigns, but this is one I definitely recommend checking out. 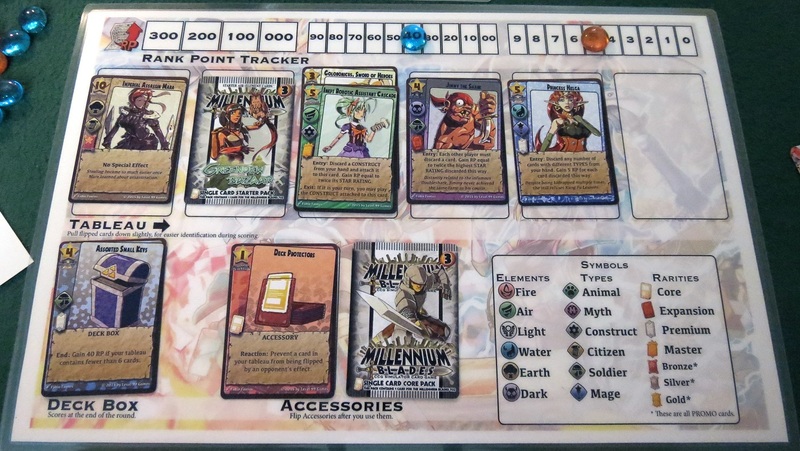 Posted on April 13, 2015, in Board Game and tagged Board Games, Level 99 Games, Millennium Blades, The Fruits of Kickstarter. Bookmark the permalink. 6 Comments. You had me at “Level 99 Games,” basically. I’ve enjoyed pretty much everything I’ve played from them over the last few years. Thanks for the preview! Level 99’s games are always enjoyable, and this looks no different. With this being designed by the creator of the BattleCON Indines games, I almost wish they had instead built a simplified duel system and had it be the core of the tournament half of the game. Think how cool it would be to customize your own fighter’s bases and styles, outfit them with perks like extra life points or what have you… maybe even have each player manage a ring of multiple fighters. Then the tournament could consist of a pre-programmed series of moves as your best trio of fighters takes on everyone else. I would give some undefined part of myself to see this exist.